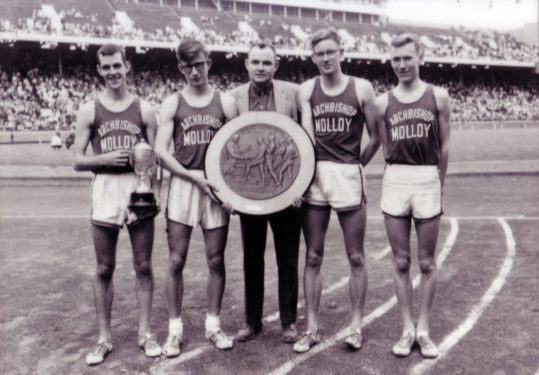 Rienzo attended Sacred Heart Grammar School, Bayside; Xavier H.S., Manhattan; and Maryknoll College, Glen Ellyn, Ill. From 1960-1969, Molloy was a powerhouse of CHSAA track under Rienzo’s leadership, winning numerous city championships during that time. He helped develop several national-class runners, including Tom and Peter Farrell, Jim McDermott and Bob Zieminski. In the fall of 1969, Georgetown University, Washington, D.C., hired the 36-year-old track coach to resurrect the Hoyas program. He only spent five years there coaching, since he was promoted to director of athletics and later senior director of athletics. Under his direction, Georgetown enjoyed the most successful era in its sports program history. Rienzo was also one of the founding fathers of the Big East Conference. He’s a member of the CHSAA Hall of Fame, the Molloy Hall of Fame and received a number of honors during his tenure at Georgetown. Throughout his journey from high school coach to senior college administrator, he cared about every student-athlete in his programs – no matter their skill level. 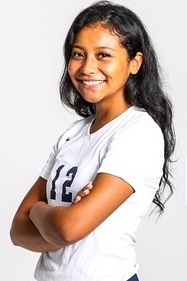 St. Joseph’s College Brooklyn, Clinton Hill, freshman middle hitter Cristina Morales was named to the All-Skyline Conference Second Team following an impressive rookie campaign. The St. Edmund Prep H.S., Sheepshead Bay, graduate was the Bears top offensive player this season, helping to lead the team to its first postseason berth since joining the conference in 2015. Morales led the team with 211 kills and 2.64 kills per set, which raked her eighth in the conference. She also tallied a team-high 244.5 pts. during the season.